Team Scary Potter and the Hauntwarts Express reviewed this attraction on October 9, 2016. Haunted Hillside returns for its fourth season of frights. Located in Mount Pleasant, Pennsylvania, this haunted, hour-long trail, guides you through foreboding environments, as you tread quickly and quietly into the realm of a cult that has taken over the farm. 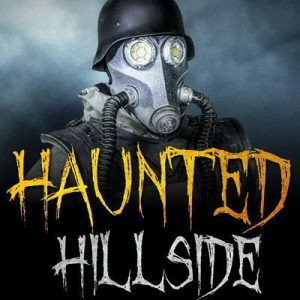 Haunted Hillside is a different take on the standard haunted house formula – an interactive journey that puts you at the center of an unfolding storyline. Will you survive to the end, or become another victim of the wicked cult? Find out the answer, only at Haunted Hillside. It became clear to us very early in the trail, that this year’s Hillsidians meant business. Understand, the night that we visited Hillside, the path was pretty gruesome in the aftermath of very harsh weather, leaving behind a generous helping of mud. To their great credit, this disrupted the performances put forth by the actors ZERO percent; in fact, many of them embraced the muck, allowing it to enhance their characterizations. The maligned malfeasers leapt, crawled, and threw themselves at us (and each other) with undeterred vigor. While we were slogging through the uneven footing between stalks, the creatures in the cornfield were darting to and fro through the rows, accosting us, disappearing, and then repeating the act with vile glee. The majority of the cast members, despite frequent similarities of costuming, each haunted with unique variance, emitting a broad range of growls, snarls, bird calls, and inhuman utterances, and impeding or transgressing us with distinct malignant flavors. Very few approached us with less than fervent determination. Our favorites included a pair of monstrosities fighting over a meal early in the trail, two different young victims who, despite slightly different circumstances, were both pushed, man-handled, and assaulted by their aggressors (to a degree that actually made it uncomfortable to watch), and realistically maintained character throughout; also, Captain Krunch (“spelled with a ‘K’ for copyright reasons only”), Dr. Mao (Meow for purists), and the Creature, who were definitely the most entertaining members of the cast overall. A large number of the foul folk we encountered were, admittedly, of basically the same ilk – if a spontaneous Scarecrow/sackboy convention were to occur in Greensburg, the Hillside would become nearly barren, so there was a definite sense of uniformity throughout the path. The attraction would probably have benefitted from a bit more variety amongst creature designs. Fortunately, though, the scare/boy costumes were well done, and fit the concept of this year’s storyline (if the story calls for 50 sackboys, then, by God, give us 50 sackboys!) . We didn’t see anything that seemed unreasonably out of place; all the costumes “blended” well onto their hosts (no half-costumes with glaringly unrealistic street clothes). Creature’s post-op apparatus-laden appendages stood out as the greatest visual accomplishment by the costumers again this year, though the witch and the horrifying cultists looked charmingly wicked as well. The remaining clusters of last-year’s-protagonists-turned-this-year’s-fodder were also appropriately attired. Haunted Hillside was easy enough to find, and, like last year, should you have any doubts about the veracity of your directions, feel free to perform the “giant screen” test upon potential arrival – can you see a gigantic projection screen from your car that only a near-sighted brontosaurus would require? Yes? Welcome to Haunted Hillside! If that carry-over wasn’t enough, they’ve added a big ol’ spotlight that we began noticing four or five miles out. If all else fails…just follow the light. And while in this pursuant state, let the multiple parking spotters guide you to a safe departure point. Returning to the projector, it is recommended that patrons take a moment before entering the attraction to relax by the bonfire and watch the background film that displays throughout the night. It establishes the events leading to this year’s Haunted Hillside, including summarizing the conflicts from past years’ outings. This is a very nice touch as it gives patient haunt-goers an opportunity to become immersed in the unfolding plot in preparation of becoming PART of it – not dissimilar to studying for a history test, but a lot more fun… and with a whole lot more Bubba. Speaking of Bubba, this impossible-to-forget member of last year’s drama has relocated to the pre-show : he and his family are now tasked with offering line entertainment and aid in loading the hay trailers that ferry guests to the beginning of the attraction. This lends to perpetual in-character bickering between the actors which enhances a normally pains-taking procedure. The higher percentage of staff members in-character, the higher the immersion level of a haunted attraction, which is a huge plus. There is a pizza-heavy concession stand, portable toilets, and an indoor ticket booth. Keep in mind that there is a very sensitive metal detector in use at the entrance to the hayride, so ensure that you leave all demon-squashing gear locked up at home. Haunted Hillside also features live bands on select nights, including the night of our visit. The staff were all wonderful and very helpful. There is a reason that we review so many outdoor, isolated attractions each year: because nothing lends itself better to generating a proper haunted atmosphere. Hillside, with its acres of foreboding forest, fields of rustling cornstalks, and relative isolation from the rest of humanity, is an excellent setting for a bit of spooky ne’er-do-welling. Though the central hub area with its bonfire and musical merriment may seem a safe haven against the impending darkness, the moment that you board the trail-bound hayride, that peaceful lull is quickly abated by the encroaching forest. The Hillside folk continue to perform an admirable job of maintaining the bisected atmosphere of the jovial hub area and the eerie ambience of the darkened haunted trail beyond, honoring the purpose of each location in the process. a discerning follower of the Dark One could possibly need. The second of these, the spider lair, was also impressive, a massive menagerie of webbing and wickedness. Unfortunately, a noticeable number of effects were inactive the night that we visited because of the previous night’s storms, including the enchanting facegirl effects from last season, BUT by the time anyone reads this review, all will be righted and back to normal. We saddened reviewers, however, are forced to interpose imagination onto memory for a few instances. Hillside’s greatest strength, and most unique property, is it’s evolving storyline. Since its first incarnation four years ago, Haunted Hillside has not remained thematically static as a haunted attraction; nor have they offered entirely new, unrelated fictions with each iteration. Instead, each version of Haunted Hillside is a sequel to all that have come before it, returning to the previous year’s story and moving it forward in more terrifying directions. For those unfamiliar with the tale up until this point, though, a synopsis is available on Haunted Hillside’s website, and a film recap plays in the hub area of the haunting grounds. This year’s interactive yarn involves a group of cultists who have displaced the local Killbilly family. Unfortunately, the narrative just didn’t seem to be as fleshed-out and recognizable – both within the attraction’s concourse and through the information provided beforehand. We weren’t entirely sure what was intended to be happening around us during our hike, as there are much fewer storyline-laden set pieces than previous years to give clarity to the chaos occurring around us. The trail started strongly, with a creepy introduction to the cultists whetting our appetite for further narrative stimuli, but didn’t really manifest much beyond that until the very end. We hope that next year’s offering is a little more story-centric and interactive. Without any kind of animatronics, mechanizations, or embedded environmental scares, when discussing Haunted Hillside’s Fright Effect, we are, essentially, relying completely on actor-based scares. Fortunately for the masochist in every haunt-goer’s heart, the Hillside has cultivated an excellent harvest this season, picking a great crop of actors (ok… two farm puns is plenty). As referenced in my Cast review, the fearsome frighteners of Haunted Hillside are robust – approaching each scare attempt with zest and determination. The scarecrows in the corn field were particularly tireless with their scare-incursions. Were there 50 of them or 5? It seems impossible to even guess. As expected, most attempts were direct, actor-to-patron frights, but several indirect emotional invasions transpired as well: enduring the viewing of OTHER people being harassed by the devilish monstrosities. Because of the intensity displayed from both halves of these assaults, these experiences felt incredibly realistic and struck our emotional cords with guttural ferocity – a wholly different (and longer-lasting) type of scare than we are used to. Throughout the trail, through, we saw haunts being quite evenly distributed amongst our processional. It’s interesting – in a lot of ways, Haunted Hillside is the reverse polarity of last season. I summarized that the jump-scares were ineffective, overshadowed by a lingering dread established through the pervasive story elements, and interactive segments. This year, that script is flipped entirely – it is the one-off actor scares that provide the bulk of the scaring larder, with the story scenes largely absent. This doesn’t make it any worse of an attraction, really, just different than what was expected. The trail took us approximately one hour to complete again this year, and the cost remains $20 – so, 3 minutes of entertainment per dollar spent is worthy of the top percentile for the bargain-conscious customer. Qualifying Haunted Hillside this season is complicated – as per our expectations of what we thought the attraction WOULD BE (based upon our experience last season), truth be told, we were disappointed. The strong interactive narrative that drew us in so much before just never quite fully surfaced this time around. That unique spark of creative, interactive fiction that was so promising last year feels like it retreated a few steps. In this manner, Haunted Hillside let us down a little. HOWEVER, ironically perhaps, Haunted Hillside DID improve its more traditional haunted attraction elements – a vastly improved collection of scare-actors made each step along the trail much more harrowing than previous years, offering a cornucopia of legitimate and impassioned scare attempts. In fact, overall, I’d say the average haunt-goer may rate the attraction an improvement on the whole. So here’s the challenge: next season, can Haunted Hillside maintain this new-found scare-zeal and return with a stronger storyline and thematic set pieces? If so, that combination could be completely mind-blowing. For now, Haunted Hillside is still a lot of fun, a great value on a tractor-load of Halloween scares, and a good choice for a weekend haunt-away.